Jean Ironside certainly isn’t a household name, but the truth is she has been an understated part of our decimal coinage for the last 40 years. The BBC’s One Show visited her on Monday evening to explain why. While Britain was undergoing a currency revolution in the sixties, Jean’s husband Christopher was busy designing the reverses for all the brand new decimal coins – one of which was Britannia – the female allegory who has adorned our coinage in one form or another for more than 300 years. For Jean, this meant painstaking hours of life modelling while Christopher perfected his now famous masterpiece for our fifty pence pieces. She recalls how she improvised Britannia’s strong pose with a ruler and a piece of paper to get everything just right. But Britannia wasn’t Ironside’s original idea. He had designed the whole series of decimal coins before they were scrapped in 1964 by new Chancellor James Callaghan, and a competition was opened up to the general public. Unperturbed, Ironside went back to the drawing board with the help of Jean, and won the competition with his stunning and iconic portrayal of Britannia. 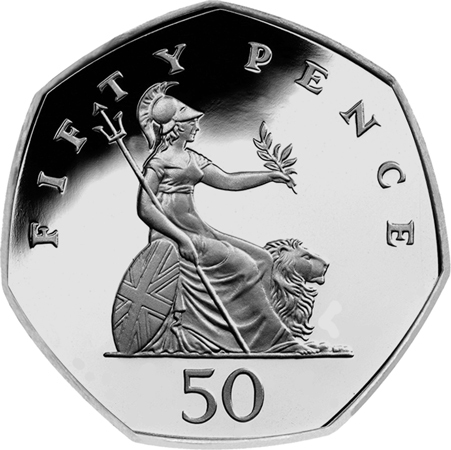 Now, to mark the centenary of his birth, Ironside’s original Royal Arms design for the 50p which was banished to the Royal Mint’s vaults has been revived for a new 50p which is about to enter circulation. Live on the One Show, Jean was given the privilege of receiving the very first of five million pressed Ironside 50p coins – an experience she described as “absolutely wonderful”. A fitting way to pay tribute to a true numismatic artist and his dutiful Britannia. Order you very own uncirculated Ironside 50p here, with free p&p!